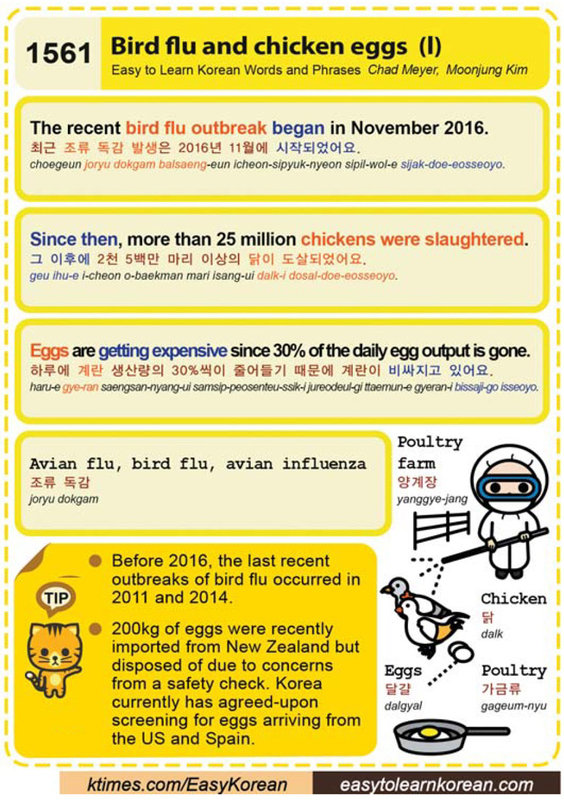 Easy to Learn Korean 1561 – Bird flu and chicken eggs. This entry was posted in Series and tagged Avian flu, avian influenza, bird, bird egg, bird flu, Chicken, chicken egg, chicken flu, Eggs are getting expensive since 30% of the daily egg output is gone., more than 25 million chickens were slaughtered., New Zealand, poultry farm, safety check, Since then, Spain, The recent bird flu outbreak began in November 2016., US, 가금류, 그 이후에 2천 5백만 마리 이상의 닭이 도살되었어요., 달걀, 닭, 양계장, 조류 독감, 최근 조류 독감 발생은 2016년 11월에 시작되었어요., 하루에 계란 생산량의 30%씩이 줄어들기 때문에 계란이 비싸지고 있어요. by easykorean. Bookmark the permalink.